“Masserie” = FARMS Arepresent a close relationship among man life, work and production. They testimony the type of economic and social organisation of the land and of the rural settings that dates back to the Medieval period. They were built for the farmers who worked the fields even if they belonged to the rich landowners who benefited of a part of the harvest. The other part was of the farmer who, in such a way, also gets the home for his own family. The production was mainly the growing of wheat, olives, and cereals, besides cattle-breeding, milk and cheese production. All the farms had a tower that was almost never inhabited by the farmer, but it was inhabited by the owner. The other purpose of the tower was to make sighting easier. The lower part of the farm was used for milk working. Around the tower there was often a spiral staircase that could reach 15 or 16 meters, next to it there were always a well, basins for washing and watering places. Lecce district has many examples of farms: Rauccio: it is between Surbo and Torre Rinalda. It has ruins of a chapel and a cylindrical dove-cot located not far from the simple line tower that dominates the verdant landscape. In 1755 it belonged to the Convent of Santissima Annunciata of Lecce. In the neighbourhood of this farm there is another one called Masseria Barrera composed of two flanked towers, both of them supplied with embrasures in line with doors and windows. Masseria Coccioli is another one of the same importance. Though deserted, it still preserves the memory of a happy season for Salento agricultural economy. It is composed of a tower with a squared basis, an internal staircase, a drawbridge and a chapel. On the contrary, Masseria Monacelli is defaced by vandals who deprived it of its four coat-of-arms and its statue. There is also an underground oil-mill. 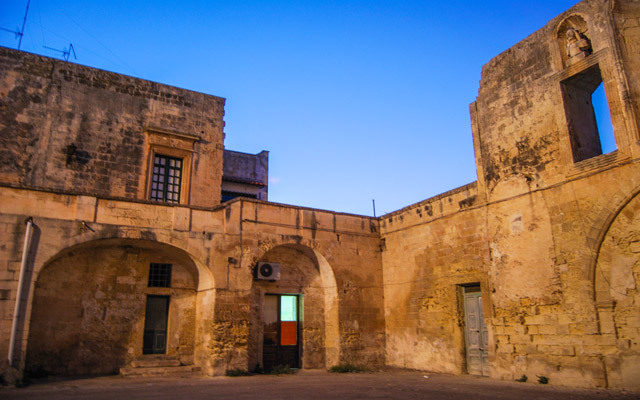 From here it is possible to see the two floors tower with an internal staircase of the next Masseria Gianpaolo that is bound to the names of the most important feudal families of Lecce, among which Federico Tafuri and Gian Domenico Cigala. Furthermore, on the road to Squinzano there is Masseria Ghietta with its two floors tower and an elegant small church dedicated to S. Maria degli Angeli. Even in NardA? lands, in times gone by, there were several farm-houses among which Masseria Carignano Grande with the chapel, the dove-cot tower with a circular basis. The elegant ashlar-work in the sixteenth century style frames doorways and windows. The building is shaped more as a typical rustic villa than a fortified farm. It also has a well and a cistern. After several hundred of meters, at the cross-roads between Gallipoli and Taranto, there is Masseria Brusca with its eighteenth century chapel and the architectural motives that surround the garden walls. At 2 Km distance, on the road that from NardA? leads to Manduria, it is possible to catch a glimpse of Masseria Nucci, a rather modest building complex with a two floors tower slightly leaning at the basis that dates back to the first half of the fifteenth century. In 1699 it was given to the Monastery of S. Chiara di NardA?. Almost at the border there is another building, Masseria Sciogliwith its two towers built during different periods. On one of them lean a brick staircase and a massive drawbridge. The decorative motives are of elegant making. In the middle of a pine forest it is possible to catch a glimpse of the outline of Masseria Giudice Giorgio, the most spectacular rural building of Salento, with embrasures and angular look-out turrets linked with a covered hall that give the effect of being close to a castle. On the road from Vergole to Porto Cesareo there is Masseria Trappeto with a scenographical staircase leaning on the tower, a room with an oil-mill and a wide wall where runs a pathway from which one reaches a staircase located on the wall adjoining the main entrance. From Gallipoli to Santa Maria di Leuca there are many other farms. On the land between Torre S. Giovanni Marina, Ugento, Pressicce and Torre Vado, there is another group of farms different for typology and structure such as the stately Torre Mammarie, the cylindrical Torre Vecchia, from Masseria Tunna to Masseria del Feudo up to Masseria Torre Pali. In the last ten years many farms were restored and became houses, but there are also farm holidays and hotels that preserve untouched the charm of the past, a landscape to discover, scenery that changes continuously but that still remains evocative. School criteria there are part time courses https://midnightpapers.com/ as well as full featured courses that include student tours, activities, social gatherings, and weekend trips available to choose from.